Do you ever end up leaving your soft contact lenses in for just a few days longer than your optometrist instructs? It goes without saying that a lot of things are a whole lot better when they're new. Well, the same rule also applies to your lenses. As a rule, you shouldn't leave them in your eyes for longer than you've been instructed to. Of course, it might not seem so bad to wear them just one more time, if you care about having healthy eyes, keep to the replacement routine given to you by your optometrist. In other words, if you've been told to change pairs monthly, then change them every month, because they can't withstand reuse. You might ask, would it be so bad if I got two or three extra days out of them? To understand this idea, let's examine protein – not the dietary kind, but the natural protein in your eyes that gathers over time on the surface of your lenses and forms a thin haze. Foggy vision is just the start. Over time, these proteins evolve and trick your immune system into thinking the formation is something foreign, which in turn can be expressed as inflammation in the eye. And when this occurs, a toll is taken on your vision. Dust and pollen also build up on the lens, slowly make it less clear Even if you take the best possible care of your contacts, sooner or later they'll become less smooth and clear, due to normal deterioration. So basically, it's best to stick to the routine your optician determines for you. 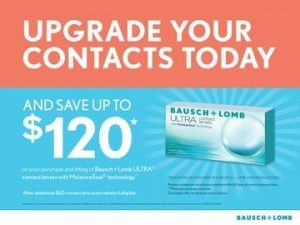 Nobody has the same eyes, so only your optometrist should decide on the right contact lens replacement routine for you. When you replace your lenses at the correct times, you will never even see the difference that is so apparent when you use them longer than you're supposed to. Visit our optometrist in Stamford to learn more about how to keep your contacts clean.